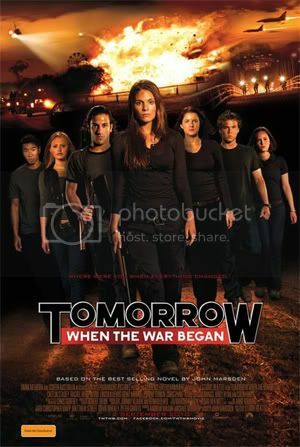 Based on the novel by John Marsden of the same name, Tomorrow When the War began tells the story of eight unlikely high school teenagers who return to from a camping trip find that their country has been invaded; they then band together to fight invading army with a dangerous gorilla style tactics. I avoided this film for quite a while because the subject matter makes me quite angry. The thought of Australia being invaded really offends me. I love Australia, it’s one of the greatest countries in the world and there is no legitimate reason for any country to invade. But it’s just a movie, a work of fiction so maybe I just need to relax a little. I read the first novel in high school but I found to be very boring and just couldn’t get into it. The movie however moves along much faster, I suppose it has to if you are trying to fit a whole novel into just over 90 minutes. The plot I find to be not very believable, if it were based on a real life situation the movie would be over in half an hour. The characters are very stereotypical; you have the rich girl, an Asian guy, a jock, a stoner, a Christian, a bad boy and a tough chick. Performances are good but not great, there are some moments that will make you cringe, which is also largely due to poor dialogue. Caitlin Stasey as Ellie gives the strongest performance, not a bad young actress for someone who was once on Neighbours. Action sequences are very impressive, and are almost Hollywood standard, which of course means it does get far fetched; such a petrol tanker being used to bring down a bridge. I think fans of the novel will enjoy this highly anticipated adaptation. I for the most part did despite it flaws. I really enjoyed this film. I saw it at the cinema with a friend and we both went in really not expecting much at all, but came out having absolutely loved it! I even wanted to see it again while it was still in cinemas but didn't get a chance. There really was some God awful cheesy dialogue in this which was combined with a bunch of TV actors not used to the big screen but aside from those small moments I loved the film. The sound in particular during all the action scenes was outstanding. Especially when seeing it at the cinema, it was one of the best sounding films I've seen all year. And I really was on the edge of my seat during the action scenes which were much better than I thought they were going to be. That's in the next movie. It you know how to drive stick, driving larger vehicles isn't as difficult as it seems. When I first drove a truck at work I was naturally nervous but it was surprisingly easy. And yeah it sounded great! As a Blu-ray title it gets five stars across the board. I've been thinking of buying it on blu-ray, ever since I saw it the first time I've been hanging out to watch it again, some scenes were just handled so well. I really hope it did well enough to garner a sequel, especially with an ending like that. According to IMDB there are two sequels scheduled for release in 2012 and 2013. Phew, that's good news. I was worried that it didn't do well enough in cinemas here, but I'm glad it did, I'm really looking forward to those sequels. Yeah I guess it did do pretty well, and the DVD and Blu-ray are getting promoted left, right and center . Really? I haven't seen any ads or posters or anything for it yet. Are there many good extras? I've seen a poster at all the major retailers and they stands set up with hundreds of copies. And it's in TV week and all that stuff. The extras are pretty standard. I only watched the two alternate endings which are nothing much. They are more like slightly shorter endings.